Do you try to pick flight that you think will offer inflight wifi? I do. I look for 767-200s, 737s, MD-80s on some routes, and try to avoid 757s and 767-300 (domestically). It’s our goal to ensure that you stay plugged-in, entertained, and engaged with your life throughout your entire travel experience, and our suite of Connectivity services are designed to do just that. So how are we doing? Let us know what you think, and you could win 100,000 AAdvantage miles and 10 one-time InFlight Wi-Fi passes. How often do you use In-Flight Wi-Fi? And why? I never turn down three things: a second helping of warm mixed nuts, baked on board cookies, or inflight wifi. Have you tried our entertainment on demand and streamed a movie/show in flight? What did you think? Entertainment on demand is available onboard all American Airlines flights on 767-200 planes – primarily transcontinental flights between New York JFK and Los Angeles and JFK and San Francisco, as well as select MD80 planes* and coming soon to 737-800 planes. We are working to install entertainment on demand service across our entire Inflight Wi-Fi equipped domestic fleet by the end of the year. Of the flights that I’ve been on this year that have offered it, I was upgraded each time. So while I’ve been able to try out the new Samsung Tab entertainment system, I still haven’t tried the Entertainment on Demand service. I look forward to giving it a try the next time the Upgrade Gods decide to leave me in the main cabin. Our mobile apps are pretty awesome! But what else do you wish they could do? They are pretty awesome and I’m a big fan of AA’s iPhone App and the mobile website. But since they asked…there are a couple of features I’d like to see added. I’d like to see an Admirals Club section with a list of locations. One that doesn’t require a Wifi or data signal (airports and international destinations can sometimes make it difficult to access information stored remotely). I’d also like it to list club amenities. It would be especially helpful at JFK, ORD, DFW if you’re trying to find a club that offers showers. Always. It’s inevitable that one of my devices is low on energy. About a year ago they started adding more powerports to their planes and the whole fleet is finished with the exception of 767-300s and the 757s. Those two are a work in progress and should be done by the end of the year. 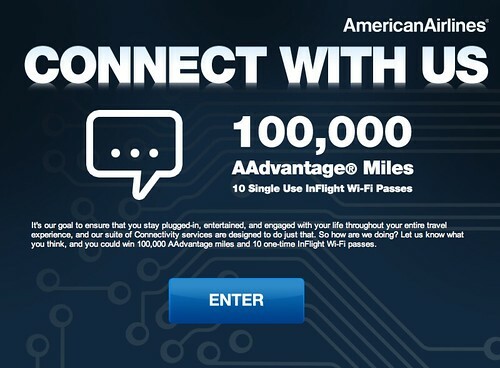 Anyway, go here to read the rules and to take the survey and enter the drawing for the 100,000 AAdvantage Miles. Wifi is a must for a traveling parent with kids! They need to be entertained if they are not sleeping! For the WiFi app question, I answered “Allow AwardWallet to track my Advantage miles?” Technically nonsensical, but if many of us answer similar, who knows? @ Mikes – It’s worth a try.